$29.95 In stock. Order in the next 16 hours, 58 minutes and it will go out today! In stock. Order in the next 16 hours, 58 minutes and it will go out today! EVERYONE wants to learn this routine--it IS that good, and a trick we feel you would get lots and lots and lots of use from. 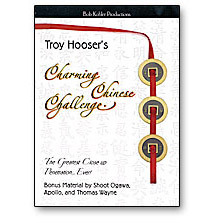 And there's no better way to learn than being taught by the creator, Troy Hooser, in great detail. This DVD teaches the entire routine (including all sorts of variations, like a mid-air link) in great detail and step by step fashion. Please Note: four Chinese coins needed to perform. Get yours from us!